We all love a good David vs. Goliath story, especially when David is a fledgling independent designer and Goliath is a billion dollar retail giant. The latest David to raise arms is Alice Saunders, the designer behind Massachusetts-based bag company Forestbound. 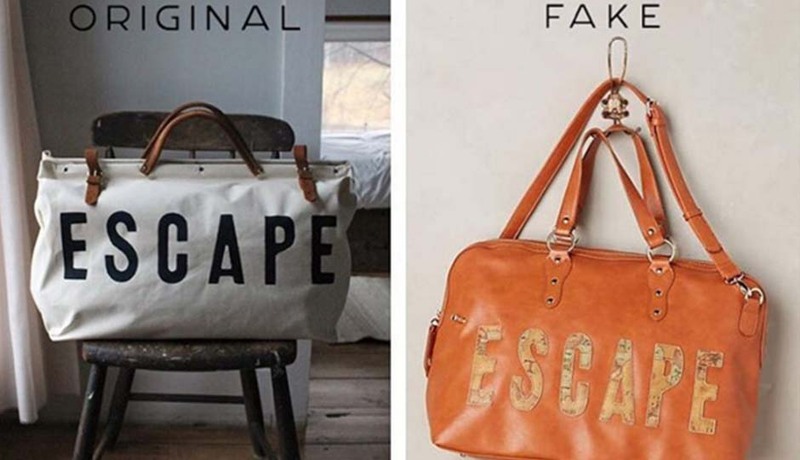 Yesterday, Saunders posted to Instagram a side-by-side comparison of one of her bags and one sold by Anthropologie (see above). The similarity of design and font is striking, and the fact that Anthro has previously collaborated with Saunders (and so is obviously aware of her brand and products) dashes any hopes of this being purely coincidental. A screenshot of the bag listing on Anthropologie’s website. 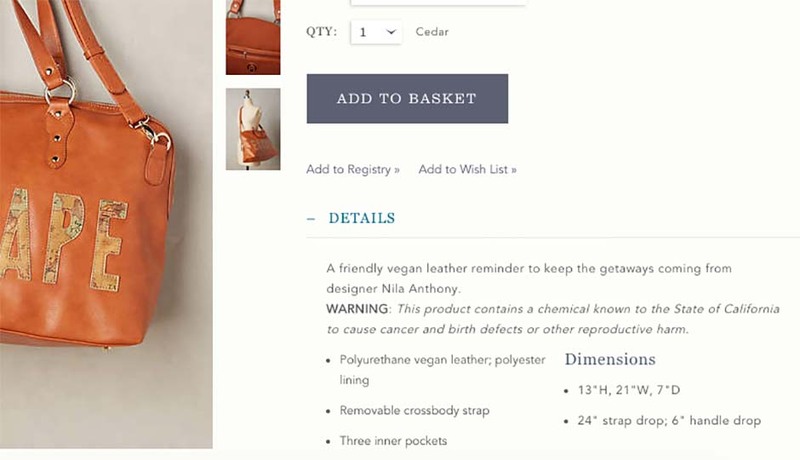 The warning is right under a cheery description of the bag as “a friendly vegan leather reminder to keep the getaways coming.” Friendly? What part of cancer and birth defects is friendly? The bag is made of polyurethane vegan leather, the Material Formerly Known As Pleather. The use of polyurethane in fashion and accessories isn’t anything new, and it’s widespread. In fact, most synthetic leathers are made from polyvinyl chloride (PVC) and polyurethane. (I find it interesting that something labeled ‘vegan’ can contain so many chemicals.) Pleather experienced a grand fashion resurgence back in 2013, thanks to designers like Joseph Altuzarra and Tom Ford. But it’s a material you should probably think twice about: Back in 2010, researchers tested bags made from PVC and discovered “extremely alarming levels of lead in some handbags from top retailers.” Eek. Though the risk might appear to be slight, I wonder why a company that rakes in over a billion dollars annually would bother to dabble in items that require any warnings in the first place. In fact, why deal with pleather at all? Lucky for those of you who like the bag, well, there’s another, better, less-risky option out there. (Hi, Forestbound!) It’s proof that sometimes you don’t need to reinvent the wheel. Or, as the case may be, slightly modify it with cheaper materials and pass it off as your own.